The Department of Public Works recently released the 2015-2016 Leaf Collection Schedule, which begins on November 2nd. This coincides with the end of permit parking enforcement at the end of October. The map and schedule for Ward 1 is below. For leaf collection, residents are requested to rack loose leaves in the treeboxes (not the street) or to bag leave using paper bags and place them in the treebox. If there is no treebox please put leaves at the curb. 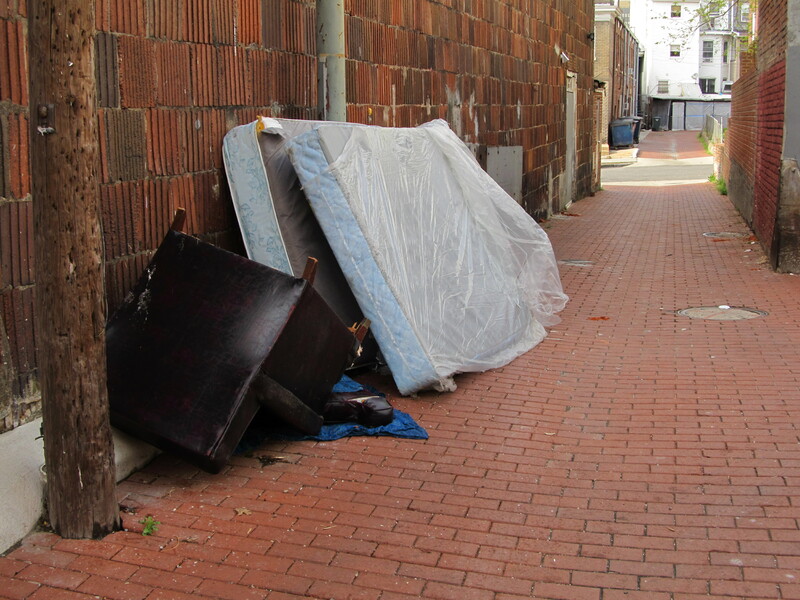 The collection is for loose leaves only — including tree limbs, bricks, dirt, rocks, or other materials will damage the collection equipment and delay city-wide collection. The 2012-2013 leaf collection schedule has been published and mailed out. If you didn’t get one, the map at the right shows the schedule for Ward 1. The full brochure is available here. 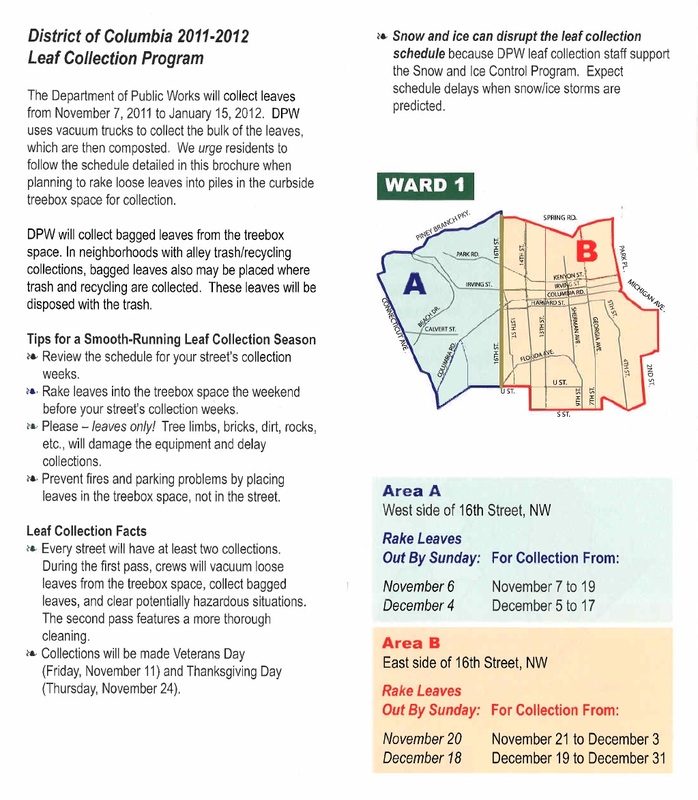 Leaf collection begins on November 5th for Ward 1 residents who live west of 16th Street. 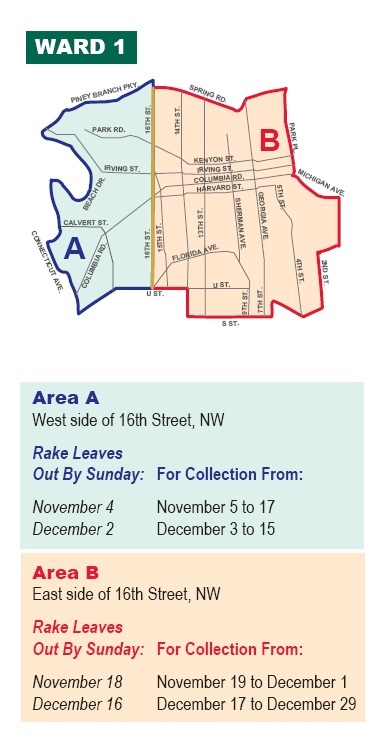 Leaf collection for residents in Columbia Heights and Park View doesn’t begin until November 19th. DPW requests that residents rake their leaves into the treebox space the weekend before leaf collection. DPW requests that residents not rake leaves into the street. This year’s fall leaf collection program runs between November 7, 2011 and January 15, 2012. DPW will collect leaves at least twice from residential neighborhoods by “vacuuming” the leaves residents rake into their treebox spaces. They will also collect bagged leaves from the treebox space or the alley in neighborhoods with rear trash and recycling collections. Bagged leaves will be placed in the landfill. By collecting leaves, DPW reduces potential accidents and injuries resulting from slipping on wet leaves and prevent catch basins (storm drains) from clogging and causing street flooding during heavy rains. DPW also will collect holiday trees from residents’ treebox spaces between January 3 and 14. Rake leaves into the treebox space the weekend before your street’s collection weeks. Please – leaves only! Tree limbs, bricks, dirt, rocks, etc., will damage the equipment and delay collections. Prevent fires, parking problems and possible flooding by placing leaves in the treebox space, not in the street. When it rains, leaves will block the storm drain and cause flooding. If you choose to bag your leaves, please use paper bags. Plastic bags will damage the equipment. You may place bagged leaves in the treebox space or next to the trash/recycling container(s). Holiday trees and wreaths will be picked up curbside from January 3 to January 14. Remove all decorations and place the greenery in the treebox space in front of your home between Sunday, January 1, and Sunday, January 8. Please do not put the trees in plastic or cloth bags. Any trees not collected by January 15 should be set out with your trash to be picked up as space in the trash trucks allows over the following weeks. As of 5 p.m. last night, the National Hurricane Center showed Hurricane Irene coming close enough to the District to potentially cause Tropical Storm force wind gusts of 30-60 mph, with higher gusts closer to the shore. In light of that threat, NWS Baltimore/Washington chose to issue a Tropical Storm Watch for our area. Residents concerned about flooding can pick up up to five sandbags from DPW to help protect their property. Details from DPW are below. (Washington, DC) The DC Department of Public Works announced today that District residents, with DC identification, may pick up sandbags (up to five per household) at its New Jersey Avenue and K Street, SE site (entrance on New Jersey at I Street, SE). Distribution begins Friday, August 26, at noon and runs through midnight. Distribution resumes Saturday, August 27, at 8 am and continues through midnight. The sandbags weigh between 40 lbs. and 50 lbs. and residents will need to load them into their vehicles. 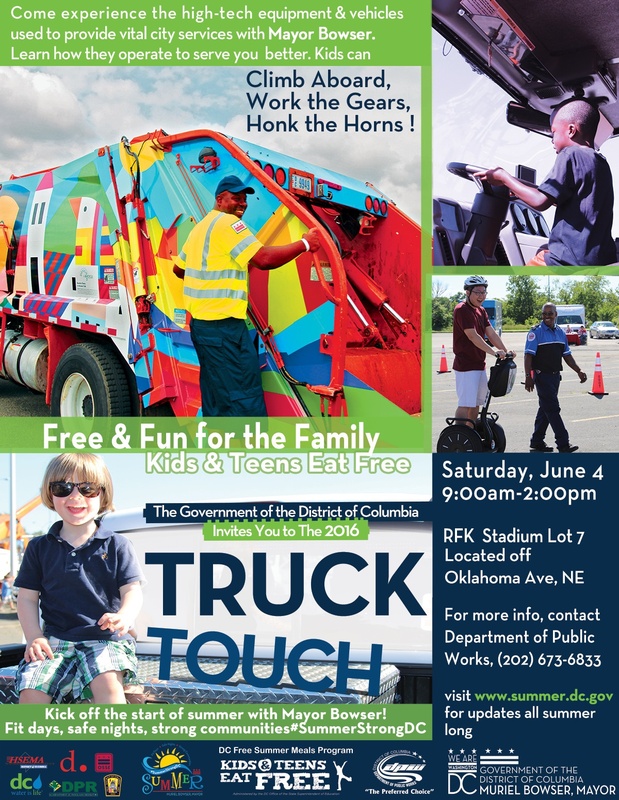 DPW will have employees and signage directing residents to the site entrance.